Income inequality and genetically modified foods (GMOs) are interrelated. Just like tumors and other health maladies, GMOs help income and wealth inequalities grow. GMO’s entered the US food chain in 1994. The United States Food and Drug Administration (FDA) had approved GMO’s for the US food chain for humans in 1992. The GMO corporations provided the evidence of its safety, which, reportedly, were tests demonstrating that rats fed GMO food for three months did not develop health problems. The folks at the FDA apparently did not care what happened to GMO fed rats after three months. What mattered is that pesticides and herbicides were genetically placed within the seeds of food plants, such as corn, canola, and soy. 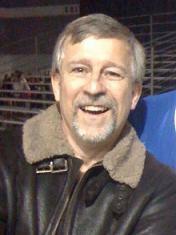 As the seeds grow into plants, so, too, do the pesticides and herbicides. When you eat corn, canola, and soy, you eat the pesticides and herbicides. More than 80 percent of corn, canola, and soy grown in the US today are GMOs. So are large amounts of many other crops. 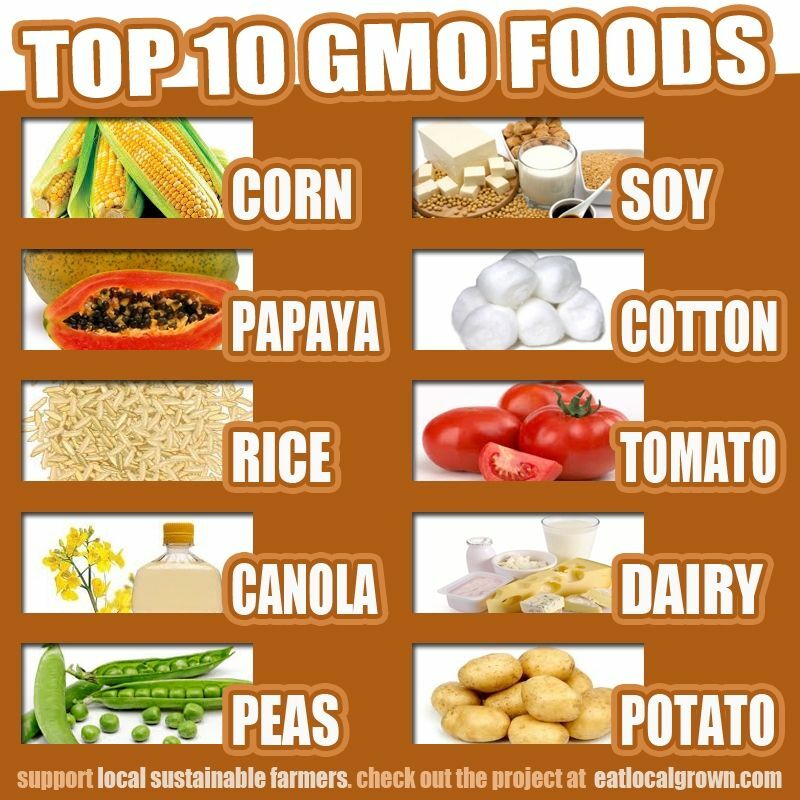 Numerous studies show GMOs cause health issues. For example, a study in France found that rats fed GMO foods for over three months developed all sorts of health issues, such as tumors and other organ damage (Click here for more information). Also, see the video above. Why are we eating this poison on such a massive scale? The answer is simple. GMO plants have the herbicides and pesticides in them. The pesticides kill bugs that bite into the plant, while the herbicides kill weeds that might otherwise grow within a few feet of the plant. That makes GMO crops less labor intensive, thereby reducing labor costs, and raising profit margins. Increased profit margins mean higher corporate earnings and share prices than would otherwise be the case in the absence of GMOs. 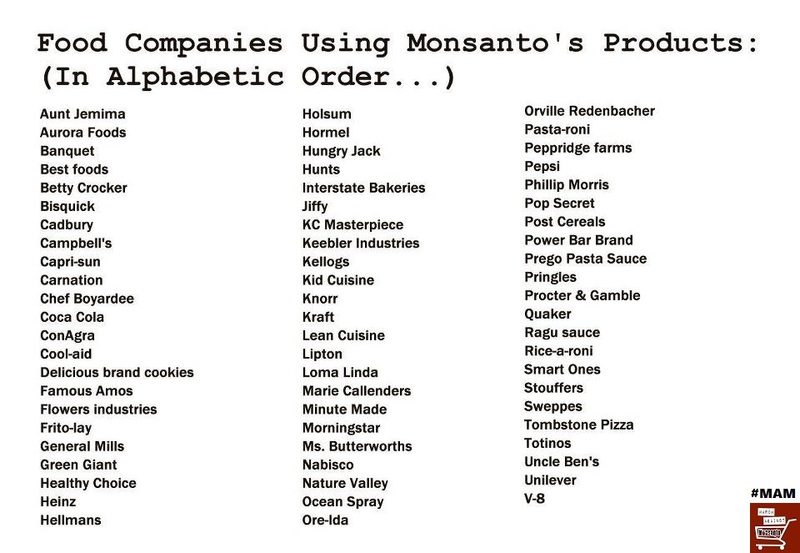 That’s why many corporations use GMOs, such as Kelloggs, McDonalds, Purina, Quaker Oats, PepsiCo, Swansen, Heinz, and on and on. The list is almost endless. GMO’s are one of the reasons why income and wealth inequality are at such high levels. 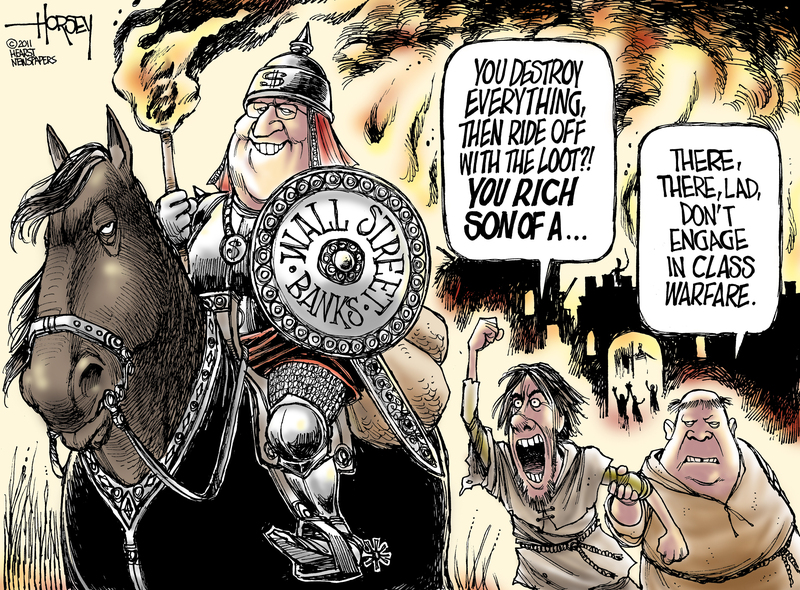 The rich disproportionately benefit from rising corporate profits and share prices. Currently, the top 1 percent own more wealth in the United States than the bottom 90 percent. For more information see The 1 Percent Own More Wealth Than the Bottom 90 Percent. The top 1 percent are stealing up to 37 percent of all income created in the United States nowadays, compared to just 8 to 10 percent in 1980. See The rich are now getting more than 36 percent of all income. There is one more advantage the rich derive from GMO foods. Profits can be increased on GMO foods without raising prices. In some cases, prices might even decline while profits rise. In the face of rising inequality, the increase in food prices is slowed by using GMO crops. Otherwise, prices might rapidly increase, resulting in consumer dissatisfaction and even perhaps food riots. Cheap food depresses the discontent of the masses, helping to keep them in line even as the rich rob them of their health and money. Ultimately, your health is being redistributed to the rich via GMOs, increased corporate profits, and rising share prices, and your government has approved this health and income redistribution scam. How Much of Your Income Has Been Redistributed to the Rich? 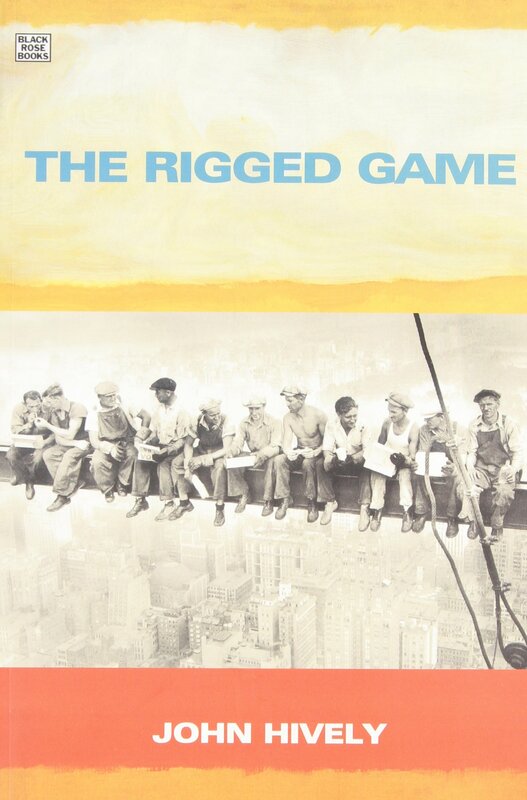 Do you ever wonder how much of your income has been redistributed to the rich since 1980? How much would you be earning now if the rich were only getting the same share of our total national income as they did back in 1980 or so? Back then the 1 percent stole only about 8 to 9 percent. We got the rest. 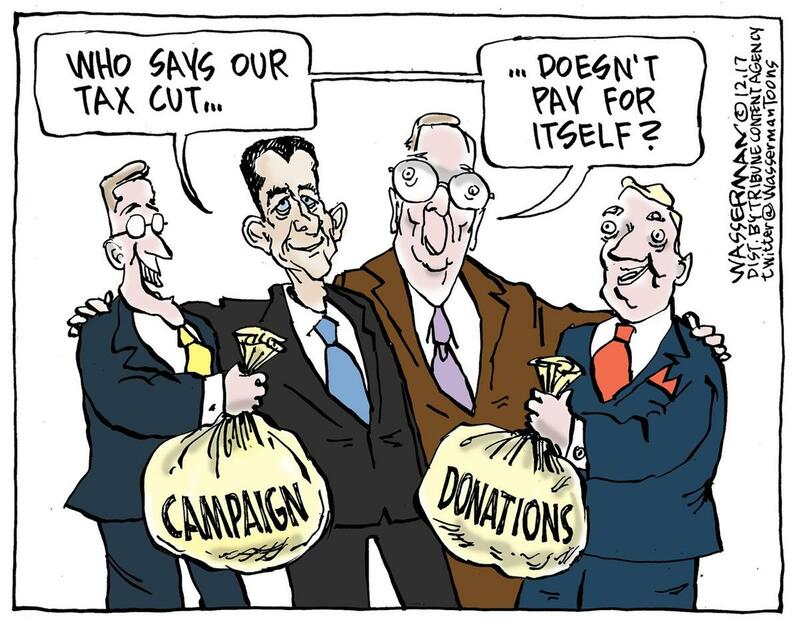 Now, thanks to the entire corrupt Republican Party, and the vast majority of corrupted Democratic Party politicians, the rich are officially stealing anywhere from 24 to 37+ percent of the total national income, depending on whose figures you are using. This is thanks in large measure to such Democratic Party politicians as Wall Street Senator Ron Wyden, as well as both Clintons’. We can use Oregon as an approximate gauge for the entire nation since Oregon is only slightly above average in personal income compared to other states. 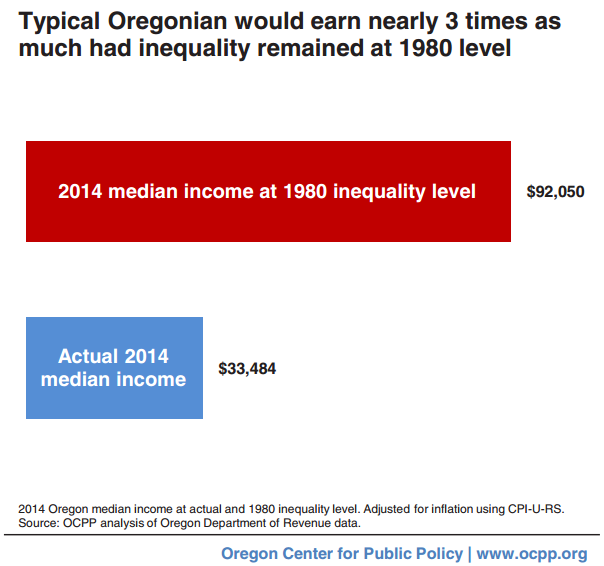 The figures in the graph above show that the typical Oregonian would be earning “nearly 3 times as much” today “had inequality remained at the 1980 level. 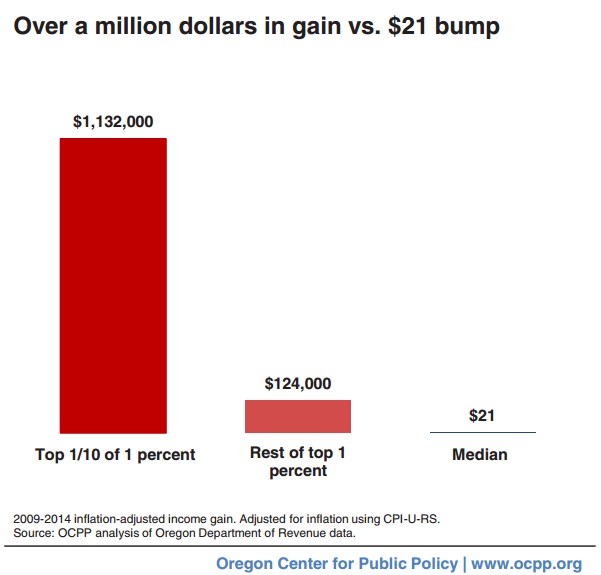 Oregon’s actual median income in 2014 was $33,484, compared to $29,150 nationally. In 2014, the average working Oregonian would have earned about $92,050, or nearly three times as much, had the 1 percent been only stealing from the rest of us at the same rate as they had been back in 1980. That suggests the average US citizen would have been earning around $83,000 a year in 2014, rather than the paltry $29,150. When inflation is factored into income growth, notice which economic class has gotten the big raises since 1980 in the graph below, and which has not. Note also that the information presented is based on income tax returns, so the US rich have gained quite a bit more than it appears since they have stashed trillions of dollars abroad in Switzerland, Panama and elsewhere.